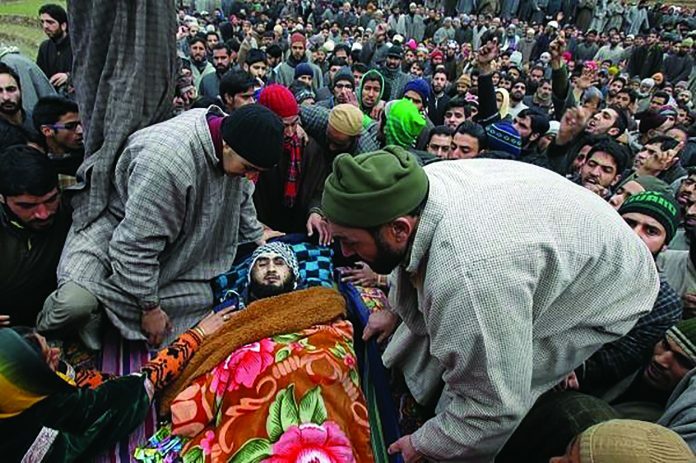 Casualties continue resulting from the oppressive and violent treatment of the Kashmiri people by Indian forces. Srinagar, March 5, 2017 – A 15-hour long gun battle between Indian security forces and Kashmiri freedom fighters ended in Tral, South Kashmir’s Pulwama district on Sunday morning. The encounter began the night before, after security forces blocked off the area and launched search operations based on tips regarding the presence of Hizbul Mujahideen in the village. As the news about the battle spread in the area, civilians threw stones at the forces. Forces fired into the crowd with tear gas and pellet rifles. Subsequent to the ongoing clashes, a local magistrate imposed Section 144, which forbids free assembly of more than four people, in the area. The mobile network in Tral was also restricted as the encounter raged on. The partial blinding of six young men during protests in Tral has emphasized the ongoing use of pellet guns in Kashmir, despite global criticism, calls for a ban and even guarantees from Indian security forces. The six were injured when security forces fired pellets at protesters who were trying to impede a counter-insurgency operation in Tral in which two freedom fighters and a policeman were killed. A senior physician at SMHS Hospital in Srinagar, where the young men were taken, spoke to news reporters saying that the injuries were serious and the men would have to undergo a series of operations before doctors would be able to determine if their vision would return. Meanwhile, clashes again broke out between youth and police at Mohamadpora village of Kulgam, after forces were laying a siege. Reports said that when Indian armed forces laid a barricade in the village, the youths of the village took to the streets and pelted stones on forces to disturb their operation and help the freedom fighters to break the barricade. Police fired several teargas shells to disperse the protesters who had gathered. The youth showed stiff resistance and several youths, including women, were injured in these clashes. Though the international community, especially media outlets outside the region remain mute on the events occurring in Kashmir, the people there are determined to continue the struggle for freedom.